We’re excited to announce the launch night for the first Adelaide Artificial Intelligence Meetup on the 23rd August 2018 from 5.45pm until 8.00pm. Open to anyone who has an interest in AI, this is an opportunity to join a community of like-minded people to chat, discover, and promote the latest in AI (both locally and across the globe). Our goal is to actively encourage a wide ranging and diverse AI community in a friendly and fun format. So whether you’re a professional, a developer, an enthusiast, or just plain interested, please come along and spread the word! Held at Bendigo and Adelaide Bank with drinks, nibbles and lots of networking. 5:45pm: Drinks, nibbles and networking. 6:00pm: Dr. John Flackett: Head of AiLab - Welcome, official opening and presentation. This event will be held at Bendigo and Adelaide Bank, 80 Grenfell St, Adelaide, South Australia 5000. AiLab and koolth are proud to organise, host and sponsor this event. To our wonderful speakers (Erin and Zygmunt), Bendigo and Adelaide Bank for the amazing venue and help from staff, our event supporters and to everyone that attended. We're thrilled to say that we had 100+ people attend the launch. We can’t wait for the next one. John welcomed and launched the event and spoke about plans for future meetups. He also spoke of why we wanted to bring the AI community together (Adelaide Artificial Intelligence meetup is organised and sponsored by AiLab & koolth), as well as his AI background and passion for the AI field. He was thrilled to announce that the AiLab platform has been opened up to early registrations and will be available to the public very soon. John spoke about how AiLab is aiming to build awareness around AI and support the community and industry with workshops, resources, events and global insights. View John’s full profile on AiLab. Erin Fitzgerald spoke of her work with data and shared insights on how industry can use their data. Dr Zygmunt Szpak is a computer scientist and senior research fellow at the University of Adelaide, South Australia and work's on numerous industry inspired computer vision problems. Zygmunt spoke about his work with computer vision and shared details on the awesome new Australian Institute for Machine Learning. The meetup concluded with the three panelists answering questions taken from the inquisitive and informed members. Bendigo and Adelaide Bank's vision is to be Australia's most customer-connected bank. They are Australia's 5th largest retail bank and have been working with customers and communities for 158 years. 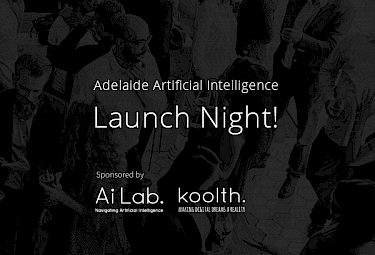 Organised by koolth & AiLab, we are proud to have sponsored the first Adelaide Artificial Intelligence Meetup.